Looking to get rid of some old junk? Your unused stuff could be someone else's treasure. Depending upon what you’re trying to sell, some services are better than others. We scoured online markets big and small, looking for the best ways to help you unload anything from your fridge to your Fendi bag. Regardless of the service, selling your old stuff isn't exactly a get-rich-quick scheme. Well-lit photos that show different angles of an item are key to drawing interest, as are setting fair prices and crafting descriptive titles with keywords buyers are likely to search for. Ease of use: Is the website or app interface newbie-friendly? Amount of work: From settling on a good starting price, to responding to buyers, to shipping items, some apps make selling stuff online more work than the profit is worth. Fees: Expect to pay at least 10% of an item's selling price to the marketplace you use – and up to 40% if you use a concierge service that takes care of listing and shipping the items for you. 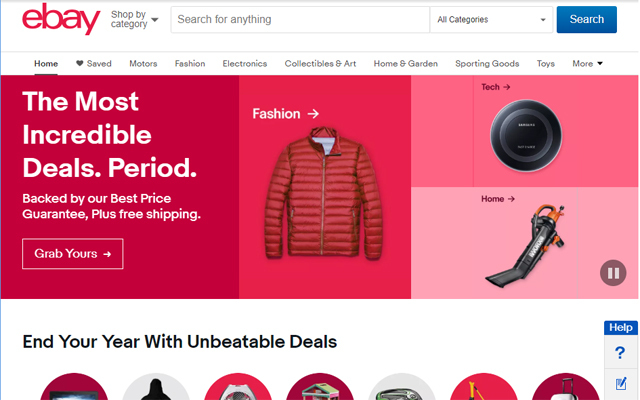 Since its launch in 1995, the online-auction kingpin has steadily added features to its marketplace, attracting professional e-sellers and real-world store owners to its original base of regular folks looking to clear out their junk. A comprehensive selling interface lets you experiment with different selling models – the $1 auction is unbeatable for attracting interest, while setting a specific Buy It Now price can help shift items that the buyer may prefer to get immediately, such as clothing. You can also add in a Best Offer feature if you're up for some haggling, or put a reserve on auctions so that items won't sell unless they hit particular prices. Best for: eBay works for just about everyone, although its listings policy officially rules out “intangible items,” specifically noting that souls can’t be sold. At any given time, there are around 800 million worldwide listings spanning clothing, furniture, antiques, collectibles and more. Ease of use: While listing an item on the desktop site involves a lengthy form that asks for time-consuming (but not mandatory) details such as the length of a shirt sleeve, posting via the eBay app is much quicker. How much work do I have to do? Just posting an item for sale is pretty quick when using the app. Snap a few good photos of the item, find a keyword-friendly title, and type up a couple descriptive sentences. If you've got a lot for sale, eBay offers features for more experienced sellers, including estimated prices and in-depth analytics for tracking your sales. The flip side is that you can end up spending an inordinate amount of time trying to craft the perfect listing. Fees: Your first 50 listings each month are free to post whether you go for auction or fixed pricing (though upgrading with bigger photos or premium visibility in search results costs extra), after which each listing costs 35 cents. eBay also takes 10% of the final selling price of each item or 12% for books, DVDs and movies and music, except records (after shipping costs and any other fees you charge the buyer, with a cap of $750). If you use PayPal – and eBay makes it a requirement for certain listings – it charges an additional 2.9% plus $0.30 per transaction. Good for getting rid of old stuff? There's a good market for broken electronics, so if you have a smartphone with a busted screen, or a laptop older than your niece, chances are another eBayer will want to strip it for parts. Overall: Selling on eBay takes the most effort, but can turn the most profit. However, the site has gotten some flack for its seller-unfriendly buyer protection policy, where sellers foot the refunds for items that don't arrive or are claimed to be significantly different from the description. Like eBay, both buyers and sellers are rated after transactions, and like Airbnb, both can opt for additional validation through real-world ID scanning, as well as linking Facebook and email accounts. The service encourages sellers to stay local with face to face transactions, and avoid shipping items without the buyer seeing them first. There are some items that are eligible for selling and shipping nationwide. The items must be available for immediate shipping, weigh less than 20 pounds, smaller than 108 inches in length and girth and sell for $1 - $500. Best for: Just about anything in your home, from heavy appliances to small decorative items. Ease of use: Modern, fresh-looking Android and iOS apps make it especially easy to stroll around taking pics of all the things you don't want before uploading each with a keyword-friendly title and short description. Buyers can then browse by neighborhood – which can give you an edge when hawking an old electric kettle that could sell simply because it's the nearest one to a prospective buyer. Buyers can message you from within the app – a good idea in case of disputes. How much work do I have to do? It takes about half a minute to post a listing, and you don't need to bother with shipping. As with Craigslist, for the sake of staying safe when meeting with virtual strangers for the transaction, it's a good idea to meet buyers in a public location. Fees: Selling can be more profitable for certain items than other sites, as there are no fees in the item isn't being shipped, and you can be paid cash in hand. Fees for items shipped are dependent on the item being sold. Good for getting rid of old stuff? Yes. 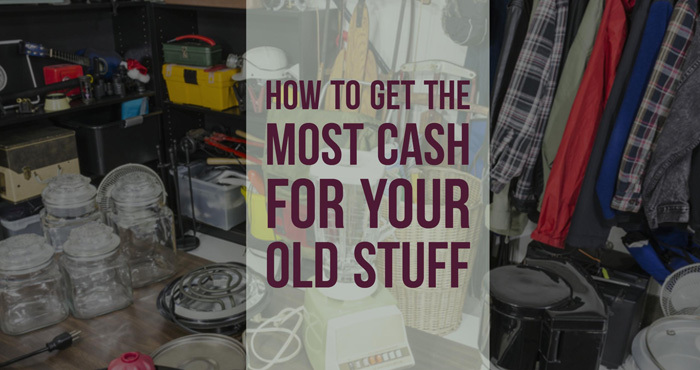 With thousands of new posts every day – compared to eBay's hundreds of thousands – there's less competition for your old stuff, and many neighborhood buyers may pick your everyday junk over someone else's simply because it saves them gas or shipping fees. 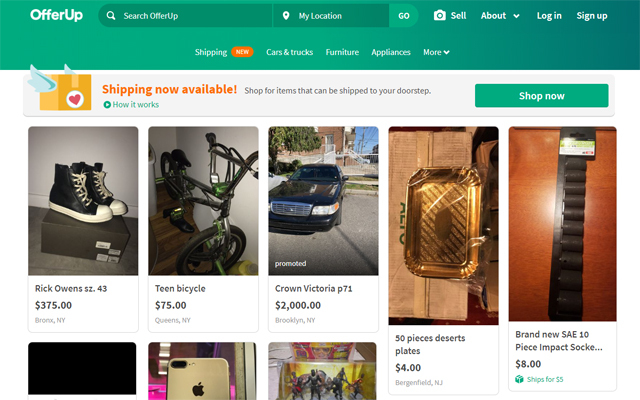 Overall: OfferUp is like a cross between eBay and Craigslist, with no-fuss, in-person transactions, and trust features such as seller ratings and user validation. There are dozens of fashion reselling sites out there, but Vinted offers an additional feature: the option to swap items without incurring any fees. If you prefer to make some cold hard cash, it's also an easy option for putting stuff up for sale. 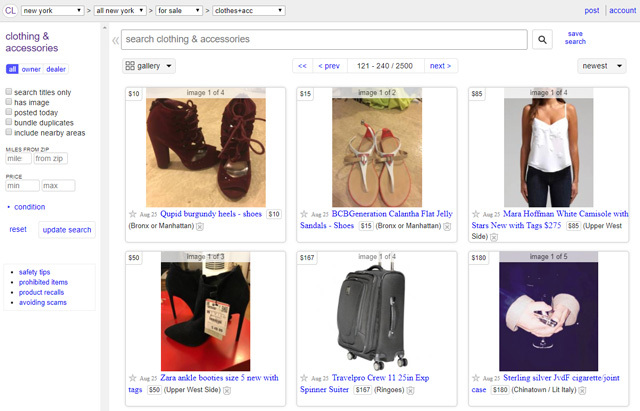 Where high-fashion-centric sites require sellers to send in their prospective items for checking before sending on to the buyer – thus lengthening the time before you get paid – Vinted lets sellers and buyers conduct their own exchanges, with seller ratings and the option to follow particular sellers and brands. Best for: Clothes that are in good condition, from mass market fashion to designer brands, though the bulk of listings seem to be for mainstream fashion. Ease of use: You can post items for sale via the web and iOS and Android apps by simply uploading a few pictures, inputting the brand, size, and condition of an item, and then writing a short description. If you're up for a swap, you can add that as an option, allowing other swappers to get in touch for a fee-free exchange. How much work do I have to do? You'll have to figure out the best price for your item, buy postage materials, and ship items yourself. Fees: Listing items is free. Buyers pay a service fee of 5% of the item's cost, plus a $0.70 fixed fee. However, Vinted hangs on to payments until the buyer confirms they've received the order and it's as described (up to 2 days after the buyer has confirmed they've received it), so you may end up waiting a week for money to be deposited into your account. A nice feature is that if you buy an item on Vinted but don't like it (and can't return it), you can relist that item for sale without incurring the fee. Good for getting rid of old stuff? If you clean, iron, and shoot good pictures of your clothing, you could turn a tidy profit. Overall: A low-fuss way to sell mainstream fashion for a teen-to-twentysomething audience. Sellers can compile a personalized homepage or “closet” showing items for sale as well items they've liked from other sellers. 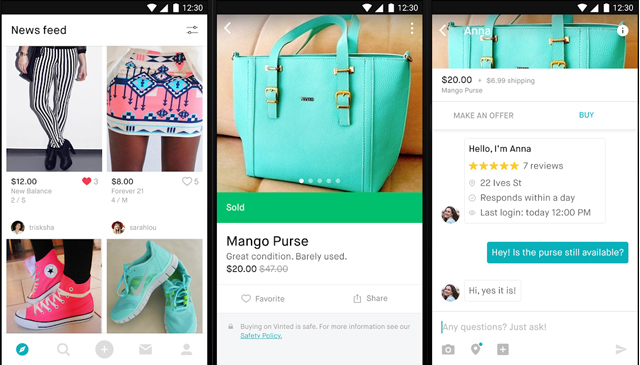 Users can follow sellers and brands in order to keep track of new items. Best for: Designer bags and accessories, with somewhat lesser demand for high-end clothing and shoes. Ease of use: The site and iOS app are streamlined and stylishly designed, with a simple interface for uploading photos, noting brand, size, and color, and setting the price, including a calculator to show what you'll earn after fees. Listings are active until they sell, without the time limit that some other sites impose. How much work do I have to do? It's minimal. You take a few photos of each item (which Tradesy edits and cuts out onto a white background for that pro storefront look), select the brand and category, and either choose Tradesy's proposed price for the item or set your own. When a sale goes through, you'll be sent a prepaid, pre-addressed mailing label and box to mail items directly to the buyer. Fees: Items can sell for anywhere from under a hundred bucks to thousands of dollars. There are no listing fees, but the site charges a flat commission of $7.50 for sold items less than $50 and 19.8% on items over $50. Its refund policy is seller-friendly – if a buyer returns your item because it's the wrong fit or style, you'll keep all your earnings and Tradesy takes care of the refund. Good for getting rid of old stuff? Only if it's branded and in good condition. 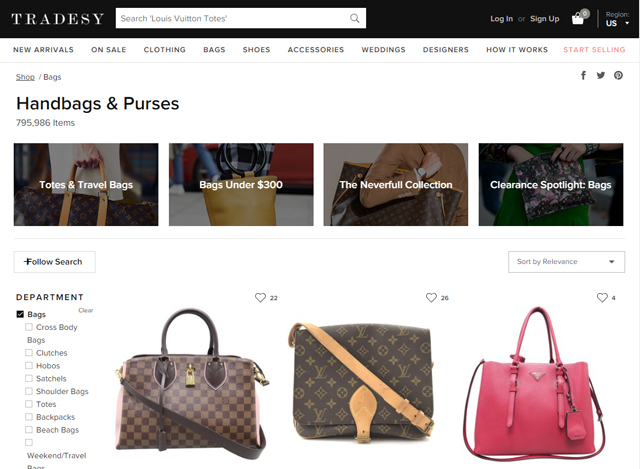 Overall: It’s great for selling your pricier items to fashion-savvy shoppers, however, Tradesy has a smaller user base than eBay, so you may get fewer interested buyers. This beautifully designed site and iOS app focus on the reselling of unique or designer homeware, as well as antiques and jewelry. The site’s homepage shows timely curations of the available products, such as barware in time for Father's Day, or items from “New Miami Sellers.” A couple hundred new items are posted each day, with the site's catalog filtered by designers, styles, and cities, so that buyers can hunt down anything art-deco in Chicago, for instance. Best for: Vintage or antique furniture, house accessories, or jewelry in good condition. Ease of use: The online form for posting items contains helpful fields for first-time sellers, with options for noting the condition of your item (anywhere from “excellent” to “needs work”), its dimensions, your description of it, and whether you'll allow local pickup – handy for minimizing the odds of fickle buyers returning items for no good reason. How much work do you have to do? You're the one to set an asking price, as well as a minimum price, but if you can't decide, Chairish can suggest a price that's likely to help you sell your item quickly. 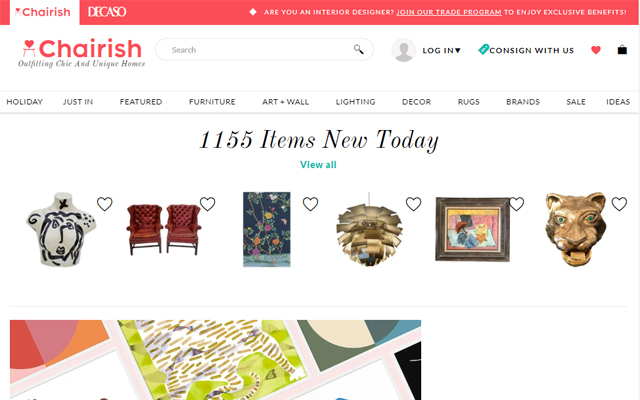 You can't just list any old item, either: Chairish must approve the listing based on your pictures and whether there's demand for the item’s particular style. After that, the listing will be live within five working days. If an item doesn't sell after 30 days, you'll be encouraged to drop the price. To make selling easier, you can opt into the Chairish Drop Off & Go service. Sellers drop off items at a nearby UPS store and they will be packed and insured for $5 - $33 per item. Good for getting rid of old stuff? Not unless it's quite valuable: there's a minimum listing price of $25 for each item. Overall: Good for selling high-value homeware to people who are likely to appreciate it. With nearly 1.5 billion users, the reach of Facebook Marketplace can't be beat. Marketplace defaults to listings in your local area, so you don't have to worry about shipping your item. That makes it great for larger items, like furniture and appliances. But there is a brisk trade in a wide range of products. Best for: Nearly anything in your house, including big items such as appliances and furniture and smaller items like clothing or accessories. Ease of use: Selling is simple. You just need to fill in the category of item, the name of the product, the price and product description (optional) and upload photos (up to 10). Facebook needs to approve the listing before it goes live. How much work do you have to do? Like Craigslist, buyers are looking for a deal. So you'll want to price your items accordingly. You'll also have to arrange to meet the buyer to conduct the transaction. If you're offloading furniture, that will likely mean someone coming to your home. For smaller items, you'll want to meet someone in a public place. Correspondence with the buyer is easy since it's all done through Facebook Messenger. Fees: There are no fees for listing items for sale. You'll need to get cash or arrange to use a person to person transaction method, like Facebook Messenger, Apple Pay Cash, Square Cash or Venmo. Good for getting rid of old stuff? Yes. And if you just want to get rid of stuff, you can list it for free. Overall: Great for getting rid of just about anything, with no listing fees and less businesslike transactions. Over 54 million people use Craigslist every month, posting anything from jobs to event listings. The buying and selling of secondhand goods represent a brisk trade on an overflowing marketplace that still looks like a 90s-era message board. It's often the place to pick up a bargain from people who just want to get rid of their stuff. Best for: Nearly anything in your house, particularly big things such as appliances and furniture. Smaller items like clothing or accessories are better suited to other sites. Ease of use: Without the need to fuss around with lengthy posting interfaces or a middleman to give you the thumbs-up on a listing, Craiglist is an extremely easy way to get your stuff out to prospective buyers. As long you write a descriptive title with the keywords a buyer is likely to search for and choose a fair price, you're likely to be able to move your stuff. How much work do you have to do? If you're keen to sell, you'll have to be on the ball with responding to interested buyers, some of whom may test you with low-ball offers that seem designed to insult. Choosing a fair price may also be tough for some, though you can always note that you're open to haggling in order to draw more interest. Fees: There are no fees for listing items for sale. You may have to price your items a little lower than you think, though, as buyers are often expecting a good bargain when they head to Craigslist. But cash in hand coupled with a no-refund policy makes a convincing case for posting here. 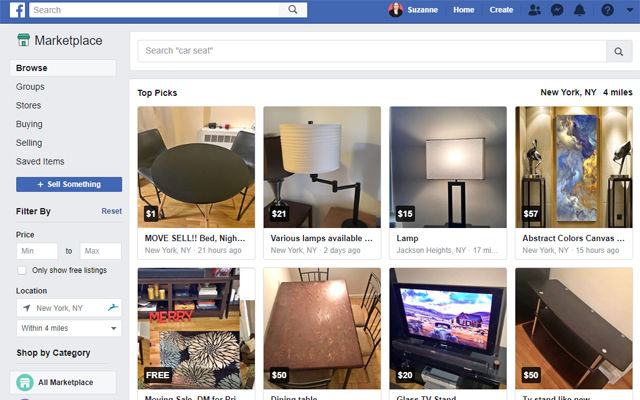 Overall: Craigslist is still the juggernaut for getting rid of bulky items, with no listing fees and less businesslike transactions. I’ve been having really low craigslist traffic this year - I’m told that many of the colleges block it (meaning half of the internet users in my city cannot access craigslist). Switching to offerup and backpage. Also noticed that craigslist “refresh” wasn’t sending listing to top, and there’s vendors that bury my ads under dozens of multiple spam ads. 4/5 of craigslist customers are also “fake check” scammers. Chairish app is okay but Chairish.com stinks. Eventually sold a couple of mid-century modern pieces. Didn’t offer free shipping so buyer decided to purchase pick up and delivery through Plycon, Chairish.com’s furniture-moving subcontractor. Plycon contacted me to arrange pick up (at a Manhattan Mini Storage location). Gave me a 3-hour window. Driver never showed up but claimed that he had. After emails and phone calls between Chairish, Plycon, and myself, and after repeatedly being stonewalled and lied to and basically being told that I’m lying, I decided that I had had enough. Chairish told me that I had no choice but to go through Plycon. Really? Part of what made this a circus is Chairish’s insistence with using their preferred method of communication—email. I had to dig around just to find their 800 number (855-549-9990). Even after talking to them asking for a return call, they instead would respond via email. After annoying them a bit (but how else to resolve?) , Chairish became completely unresponsive: stopped following up, stopped being helpful at all once it was decided at some point that I was a problem customer. Finally, I called the buyer to have her pick up the furniture. 6 weeks later buyer still has the furniture and I’m still trying to get paid $1800 - 14% commission = $1548. Avoid Chairish.com like the plague. Chairish.com treats sellers like they’re trash by employing tactics to drive down prices, forcing sellers to work with Plycon, their clueless and unprofessional furniture-moving subcontractor, and providing horrible customer service. I had a similar experience but not through Chairish. godolly.com offers delivery and they don’t outsource to a subcontractor. Also, its completely free except for the delivery. There’s no commission fee. Which is best between these and OfferUp? The app is like all others when it comes to selling to local buyers and shipping nationally. However, when it comes to an issue or problem with a transaction it will become a nightmare. It’s been over a month that I’ve been trying to resolve my issue, I’ve sent them emails, photos, app messages, etc. with no avail. I have furniture that I’ve been trying to sell for a year on Craigslist to no avail. besides losing lots of pictures, cutting the price to 1/3 of market value, and writing good descriptions, what else can I do? Try out the application ADYOYO and see if that makes a different. My advice is 2 in my advice would be for you to avoid Craigslist completely. Most enquiries are a waste of time I would say 9 out of 10 are fake, scammers, or buyer’s who dream about owning something but in the end don’t have the money to purchase anyway. My first and foremost recommendation is Facebook and join some Thrift groups in your local area. Secondly I do great locally in 5 miles and offer up apps. Usually on these apps I never sell to new members who have no purchases. You can also run into a scammer to there also. No selling venue is perfect, but these are just my simple suggestions. On a special note, I never give my address out until the buyers claim to be on my street and then I still never give my house number, I tell them drive down the street I’ll flag them down. God bless you all and Happy selling. I saw that you didn’t touch up on an application called ADYOYO. It is different than other marketplaces because you use video of the product you are selling instead of photos. This helps consumers see exactly what they are buying and the condition they are buying them in. It’s also simple and really easy to use. How to sell used products? Easy. Follow the advice in the article above. For clothing and accessories for men, women and children, it can’t be beat. The fees are higher, but for simplicity. .. the learning curve is small. $2.95 fee for sales under $15 & 20% on sales over. Buyer pays shipping of $6.95.